Exquisite Collection of Nevada Dry Creek Turquoise Jewelry by renowned Native American Artisans to compliment any Style or Budget. From the Mine (private collections) to the Stone Cutters to the Silversmiths, it has been a long journey and we are proud to present this beautiful assortment of Dry Creek Turquoise Jewelry. Seven Dry Creek Turquoise Drop Sterling Silver 17-18 Inch Adjustable Bead Necklace with matching Earrings Fine Jewelry Set by Native American Navajo Robert Concho. 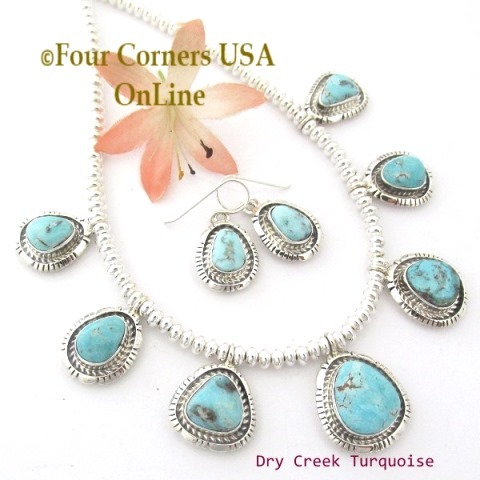 Renowned for his fine silversmithing it is no wonder Mr. Concho is the creator of this wonderful multi stone Jewelry Set of quality Dry Creek Turquoise stones. 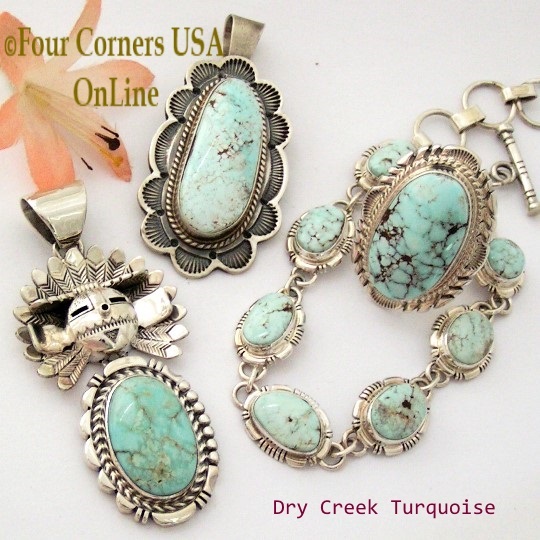 At Four Corners USA OnLine we offer an array of quality Dry Creek Turquoise gemstones in our Jewelry with many elongated large stone rings sporting rare gem quality specimens. Choose from our complete selections of Dry Creek Turquoise Bracelets, Dry Creek Turquoise Earrings including an assortment of dangle and post style earrings, Dry Creek Turquoise Pendants, Necklaces, and Jewelry Sets, as well as an extraordinary selection of Dry Creek Turquoise Rings for both Men and Women.